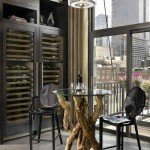 When searching for great style and trendy designs, what better place to look than celebrity kitchens? Don’t let budget stand in your way either, get the same beautiful design with our checkbook friendly decorating tips. Your kitchen will be the star of this show! Many celebrities live in New York where they are short on space even if they have plenty of money. This makes it easy for a homeowner to draw inspiration from their rooms, even if it’s just copying a paint color or going with similar appliances. Here are some of my favorite celebrity kitchens and some suggestions on what refrigerators would work well in these celebrity kitchen themees. Fashion designer Vera Wang chose a white color palette for her contemporary kitchen design. She even has a white floor. 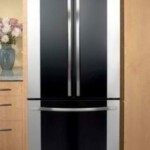 To copy this look you will want either a high gloss refrigerator or refrigerator panel. Skip a water dispenser on the door which interrupts the clean lines. Opt for white handles instead of stainless steel versions. I’m not sure if Vera is standing in front of a fridge or a pantry, but the same rules apply. LG tends to use higher gloss finishes but most of their side by side fridges have water dispensers in the door. LG’s LSC23924SW and LSC27925SW still look modern because of the monochromatic color palette. Here is the kitchen from Sarah Jessica Parker’s and Matthew Broderick’s Greenwich townhouse. I guess celebrities love to use the color white in decor. It’s difficult to tell from this angle but it looks like there are two fridges. This makes sense because celebrities entertain a lot and use celebrity chefs so they need a lot of room to store food and large trays. You might not need two fridges but maybe you’re stuck about where to put a pizza box or a larger party platter. Kenmore has a feature that will be conducive to entertaining on a smaller scale called the full-width Pantry Drawer. It’s offered on some of their French door and bottom freezer units. 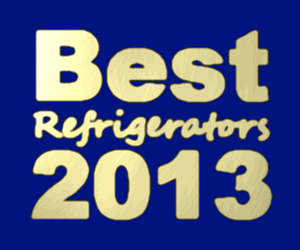 A list of just a few of the stainless steel appliances with this feature are the Kenmore 71033, 71036, and 72033. Stainless steel really compliments the color palette in Sarah’s kitchen because all of the gray in the stonework of the fireplace. Oversized metallic lighting and blue and white window treatments are easy to copy on a budget; as is the message center in the corner. Tori Spelling seems to move houses about every time she has a kid, which is often. This is her Encino home. I like how traditional it is. You could use this for inspiration if you had parquet floors, which are difficult to find good examples of because they are usually the least popular of all wood floor choices. It looks like Tori has stainless appliances here but I would probably opt for white to blend in with the cabinetry. If you have a lot of kids like Tori and Dean try a larger capacity fridge. French door styles provide a lot of fresh food storage at eye-level. The Kenmore Elite 72062 even has a butterfly door design. The Samsung RFG29PHDWP may be a good fridge for families because of the 28.4 cu. ft. and the water dispenser. This is the Spanish style house that was on The Hills. I often got distracted watching the show just trying to take in all of the beautiful decor. It isn’t your typical Spanish kitchen full of lots of dark tile, wood, and bold colors. In fact if you take out the barstools and the rugs you have a perfectly neutral room. Create the look yourself with sparkle. Find a metallic or stainless penny round or subway tile for a backsplash. Use stainless appliances and get a dramatic light fixture. Oversized light fixtures are a popular trend. This kitchen stays true to the scrollwork that is often found in Spanish style light but it’s in a different finish. 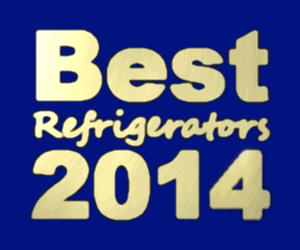 You can still get a stainless fridge on a budget if you shop for a brand like GE. Look for more traditional side by side and top freezer configurations like GSH25JSDSS and GTL21KBXBS. They both have an MSRP of under $1300. Then you have more money to splurge on the metallic backsplash! This is the kitchen in Kim’s former home. I like it a lot better than the one that she shares with Kanye now. 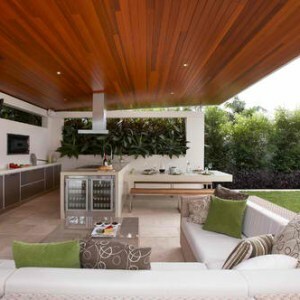 The focus is on the outdoor space and uses muted color palette. You may not have a fireplace or a flat screen in your room but copying the lighting, bar stools, and color scheme should be quite affordable. Try painting your window trim and doors black to frame out a wonderful view. This kitchen has multiple choices for fridge colors. You could choose a stainless appliance to match the range hood. White would work or bisque would even match the counters. I would choose an armoire style. Since it lacks a focal point, the fridge can add a lot to the room design. 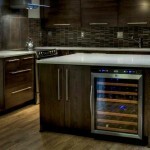 Plus, since it’s a celebrity inspired kitchen try a more expensive brand like Sub-Zero. I love the combination of glass doors like is found on the 648ProFG. A smaller bottom drawer version is BI-36UG. Doing so would bring the light and airy look from the inspiration photo and apply it to the appliances. 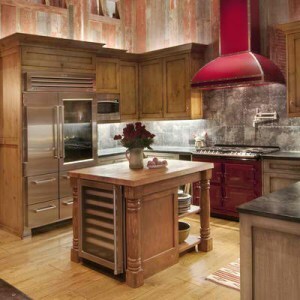 Which celebrity kitchen is your favorite?